September 7th, 1980 brings Waylon back to Lubbock, Texas for the dedication of the statue and inducted into the "WALK OF FAME". Waylon's album release listing for the 80's with R.C.A. In 1985 "BEAR FAMILY RECORDS" came out with, "THE WAYLON JENNINGS FILES"-15 L.P. s. All of Waylon's music from March 1965 /December 1972, giving fans everything Waylon had on record, even un-issued songs. But doing so with out permission from Waylon. After a letter from Waylon "BEAR RECORDS stop at # 15. September of 1985 was a high in my life. 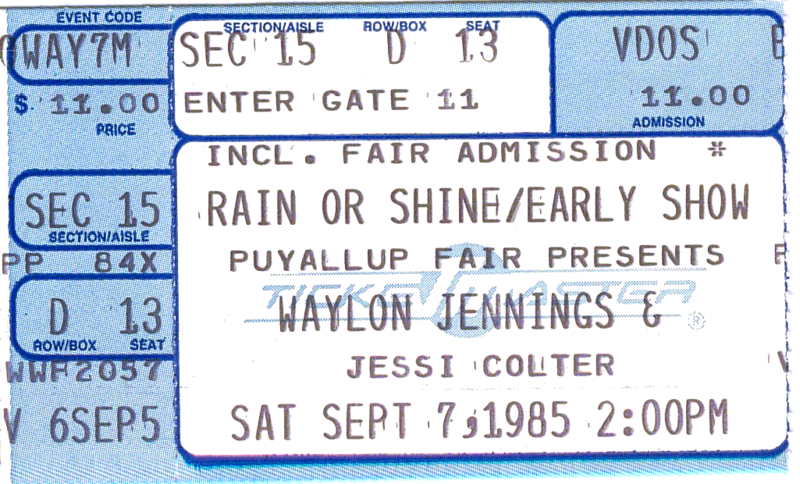 Seeing a Waylon Show at the Puyallup, Washington Fair grounds. I had some photo albums with me of years of pictures and “stuff” on Waylon. After I showed them to a few band members, I met David Trash, Waylon's road manger at the time, I went up to Waylon's bus and almost fell over when Waylon ask me on the bus to see the pictures, Jessi & Waylon looked at my 4 albums. I never put it together until later, looking at the ticket to the show, September 7th -Buddy Holly's birthday- Some things just have a way of coming together. 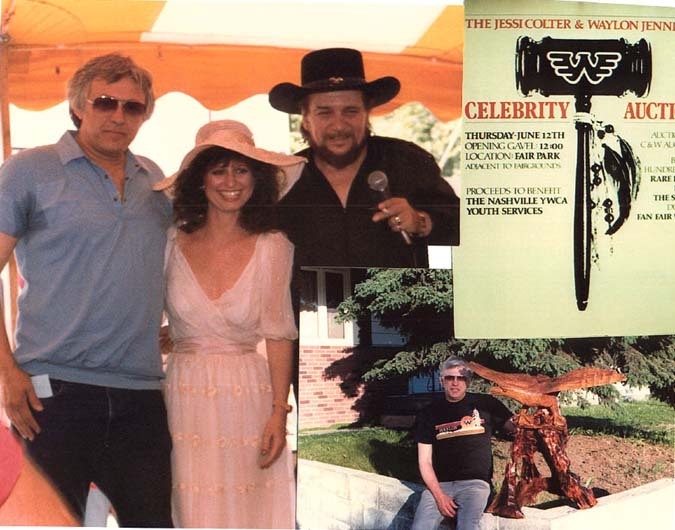 The next time I saw Waylon was in Nashville at a Celebrity Auction where I was the high bid on an eagle wood carving of Waylon's. I went to have a picture of myself with Waylon & Jessi. Jessi looked at me and said, "your the guy with all the pictures". She remembered me being on the bus a year ago. At the same time a good friend of mine, Bob Dees from FL., was in town. Bob being a good friend of "The Crickets” asked me if I wanted to go over to see J.L AIlison's home. Here I am in the house of Buddy Holly’s drummer and who had also worked for Waylon. After about an hour or so we went to see Sonny Curtis, from there it was over to Joe B. Mauldin's house. My trip to Nashville will be on my mind for a long time. Just think I saw Waylon, Jessi, and The Crickets all in one trip. The mid 80's saw something new in the music world, "compact disc", as Waylon put it in a song, "we spend two hundred thousand dollars makin' compact disc and there never scratch and there never ver-break, ver-break, ver break". It -was hard for die-hard L.P. collectors at first but the sound was so good and them L. P. s were so hard to story, them L. P. s took all the room in the world. 1985 and "AMERICA”, it was the good-bye song to years of R.C.A. and hello to M.C.A. and a renewed friendship of Jimmy Bowen. One more west Texas guy who got out of west Texas. A lot of people say this about West Texas, "its so flat in West Texas that if your dog run's away you can see him for three days". Waylon did three L P’s with M. C.A. before the devil was loose again and looking for a new way with his music. Things were moving fast in the Nashville music world. In November of 1989 over to C.B.S. Epic who gave Waylon what he wanted, more freedom. Bob Montgomery was his producer, one more west Texas friend, who went way back to the Buddy days. Buddy Holly's first "Band" was BUDDY, BOB and LARRY. This was the end of L.Ps and the introduction of C.Ds'. WAYLON-THE EAGLE was the first C D. Waylon made. Hank Cochran, Red Lane & Mack Vickery, wrote the song. The song was written about the U.S.A. at the time of the Gulf War. The eagle is the name of our jet planes. 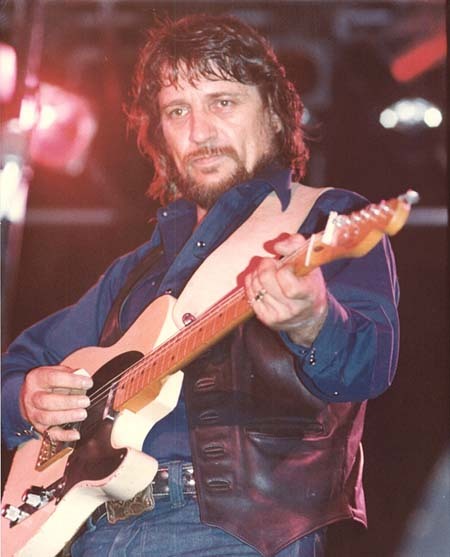 A misconception to some fans was the song being about Waylon's rebirth in his music. It was on a L.P. in the UK, but just on CD in the states. 1987 and Waylon had it on his mind to write a book about Nashville, his friends, his good times and bad times, but after thinking about it he thought maybe a few friends would not be friends if he told it all so he came up with an audio-biography and a "MAN CALLED HOSS" came about. We did not hear anything new from Waylon for almost two years; he came back with the highwaymen and gave us, "THE HIGHWAY MAN 2. WAYLON IS A PART OF A VANISHING BREED, B0TH AS A SINGER AND AS A WRITER OF COUNTRY MUSIC. WITH A HISTORY AND INTEGRITY THAT STANDS THE TESTS OF TIME. LABELED AN OUTLAW, FOR TAKING HIS STAND, THAT THE "ESTABLISHED WAY” MIGHT NOT BE THE ONLY WAY. HE HAS BLAZED TRAILS FOR MANY SINGERS, MUSICIAN, AND WRITERS, AND PERHAPS FOREVER CHANGING THE FACE OF COUNTRY MUSIC. LIKE THE AMERICAN COWB0Y, HE IS HIS 0WN MAN, - "AN AMERICAN SYMBOL” AND THERE WILL NEVER BE ANOTHER LIKE HIM. In 1994 Waylon was looking for something new and found it in Hollywood with producer Don Was, who the year before helped Willie Nelson find a new sound. From this we got, WAYLON, WAYMORE BLUES (part 2) Produced by Don Was with new people as back up. Only two people had been on any of Waylon’s album before, Robby Turner was on pedal steel and on harmonica, on guitar was ol’ friend Tony Joe White. 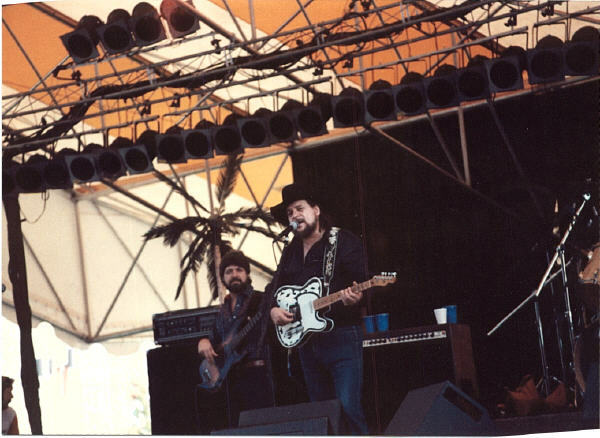 We saw Waylon in 1995 in Laughlin, Nevada, luck was on our side as we got backstage and talked with Waylon & Jessi. In 1996 Nashville was doing a Tribute to Buddy Holly and a lot of singers wanted to get in on it. Waylon being one, together with “The Crickets”. Waylon did, “Learning The Game” with Mark Knopfler. The C.D. was “Not Fade Away”. The same year Neil Diamond came to Nashville to cut a C.D. and again ol’ friends got together, “One Good Love”, Waylon Jennings & Neil Diamond. We saw Waylon twice in 1997, Laughlin, Nevada and Las Vegas Nevada. Waylon was still looking around and in 1998, a new label, and new producer. Taking off the liner notes: “Closing In On The Fire”. Waylon has often said, “I’ve always felt that blues, rock & roll and country are just about a beat apart.” Closing In On The Fire” combines these diverse styles into 11 songs that are distinctly Waylon. Waylon had some bad times after the C.D. Closing In On The Fire”. He was not feeling good and after a few trips to the hospital him & Jessi decided to move to Arizona. He cut back on doing shows and recording. On July 3rd 1999 Waylon was back in Las Vegas, Nevada. Taking the stage at the Texas Station. We went over for the sound check and standing around was Kris Kristofferson. When I saw him, I said “How about a picture with you?” He said, “sounds good to me” here I was seeing Waylon and had my picture with Kris Kristofferson, that made my day. We saw Waylon again on December 11th 1999 in Vegas. Waylon may have had more number one hits if R.C.A. would have not put a lot of songs in the can. Songs like J.J. Cole's CLYDE was cut 5 years before R.C.A. put it out. Even today R.C.A. has songs in the "can". Maybe some day we'll get to hear them all. One of the best things R.C.A. did was in 1993 they come out with a 2 C.D. box set of Waylon's songs, and if any fan does not have this they better get it together and "get it”. This is 40 of the best Waylon music in the world.